Cengar air-operated Planisher for the 1950s garage. Homepage. This page: A labour-saving device for motor body repair work in the 1950s. Any garage in the 1950s that saw a regular trade in fixing up crash-damaged cars, would no doubt have found the services of a compressor-driven planisher most useful. Not only did it open up the opportunity to offer panel-beating repair work to garages that hitherto were unable to offer that service, it also enabled work to be accomplished in a much shorter space of time, once the user was familiar with the equipment. The illustration on the cover of this 1950s leaflet shows such a machine in use, seen here straightening out a dented front wing. Many repairs of this type could be achieved without removing the panel from the car, another labour-saving benefit of the Cengar planisher, as the introduction inside the front cover describes. 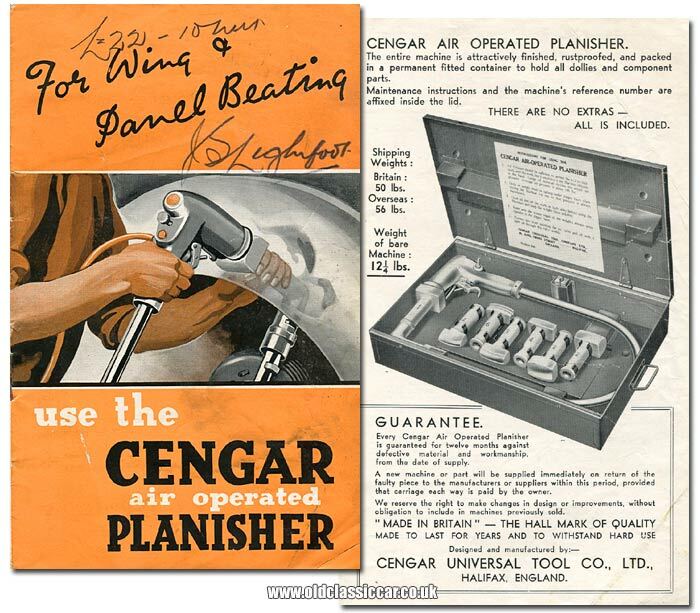 The Cengar air-operated planisher is not a new tool. Its worth has long been proved by car manufacturers and repairers, service stations, bus companies, haulage contractors and the sheet metal trades. Today it is used in all parts of the world. Now available at a most reasonable price, the Cengar planisher quickly earns its cost and proves its manifold advantages. Skill on the part of the operator is reduced to a minimum and results equal to finest hand finish can be produced in a fraction of the time. 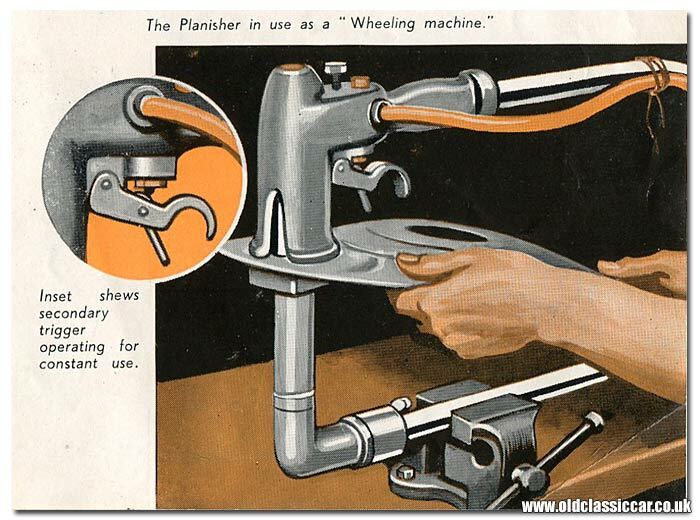 Because of its practical design, skill in panel beating is transferred to the planisher. The hammer motion is actuated by air pressure from the ordinary receiver and the beats can be controlled from slow to 10,000 impulses per minute. No doubt traditional panel beaters were less than impressed when what to them were straightforward repair jobs, were instead passed to less skilled mechanics wielding a planisher such as this. Despite the skills required of an operator being minimal, as suggested by this leaflet, the user would have to have a good understanding of panel beating techniques in order to extract the best use of such a tool, so it was still no job for an out-and-out beginner. In unskilled hands, a planishing machine such as this could easily transform minor impact damage into something worse. The Cengar product came supplied in a sturdy metal box, with all its components neatly laid out and labelled. Seven dollies were included, all "Made in Britain - The Hall Mark of Quality". The operator held the dolly rest below the area to be repaired (as shown on the leaflet's cover), while the hammer head unit was placed on the panel above the dolly, its actuation controlled by a trigger and regulator/speed control. Clamps that came with the unit also enabled it to be used as a wheeling machine, as shown below, adding to its versatility.